Mississippi Praying is a powerful and important book; it is thoroughly researched, carefully argued and beautifully written. 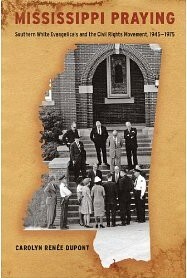 It sheds considerable light on the response of white Protestants in Mississippi to the civil rights movement of the 1950s and 1960s, and it dares to draw connections between those responses and the positions taken by conservative Christians in the state in the years since the 1960s. Many of these people continue to tell themselves and others that their dissent from more socially conscious elements of their denominations “wasn’t about race”; Mississippi Praying shows that the matter is not that simple. And with this, Stephen Haynes concludes his review of Carolyn Dupont's book, Mississippi Praying: Southern White Evangelicals and the Civil Rights Movement, 1945-1975. I had solicited this review while I was still the book review editor for the Journal of Southern Religion. I also managed to have Carolyn review Stephen's book, The Last Segregated Hour. Then I interviewed them both for Marginalia Radio. Synergy? Since interviewing Carolyn, her book has gone on to win the Frank S. and Elizabeth D. Brewer Prize presented by the American Society of Church History. A well-deserved honor, indeed. She also took over my position as the JSR's book review editor, and has done outstanding work as evidenced by the extensive list of superb reviews. We recorded this interview at her house in Lexington, as I just happened to be passing through Kentucky (as one does). Carolyn is a runner, so we both hit the roads beforehand. My memory recalls an almost perfect winter morning for a run. A light crust of snow on the ground, minimal wind, and temperatures in the mid-30s.